One of the challenges about being a "part-time" farmer is that unexpected situations can really wreck havoc with your day. I arrived home after a particularly long commute to see my better half running towards the gate in a panic. I rolled down the window to hear the four words that most farmers cringe at. I have never moved quite so fast - changing into my farm gear and running for the pasture, grabbing half a loaf of bread as I ran past the bread bin. The damage wasn't so bad, fortunately he didn't knock out the cedar fence posts, only the railing in between. I shook my head at the damage, and sighed. 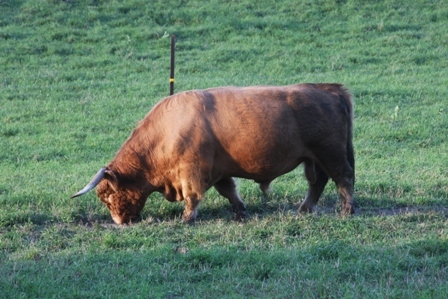 Putting up the new electric wire was on the to do list for the weekend, it seems our bull didn't want to wait. The bull looked at me with baleful eyes, and seemed to be apologetic. We managed to get him down into the barn area, using bread and grain to lure him into the barnyard -- and then strung a temporary electric fence to keep him there. What followed was 2 hours of fencing, in the dark cold drizzle and rain. As I pounded fence insulators into the old grey cedar posts, I realized that this is the side of farming which most folks don't think about. The fact that there is no "9-5" work day. Farmers are on call 24/7. Whether it's to assist in a lambing, fix a fence, or check on some chicks in the incubator... you are always on call. Hours later, curled up together on the worn out old sofa in our family room, I asked with a smile "so what do you think, too much work? Should we give up the farm?" My dear sweet man smiled at me as he grabbed the latest copy of Ontario Farmer to read the classifieds "Never".